At the convention in October, there is a call for art/craft, talent, and food entries (kind of like a state fair, at the scale of the state grange). If you are interested, let me or Alan know, and please fill out the form (PDF download on the left margin of this website under “showcase book”). I don’t know if you have to be present to “win”… lots of different categories from creative writing to floral arrangements, pie to pickles! Just follow the directions if you’re interested. 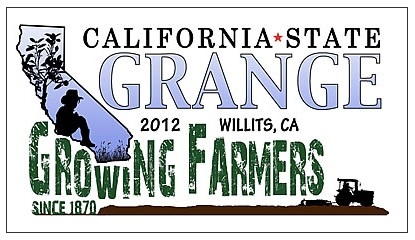 Showcase of Grange Artisans. Thursday, October 11, evening. Celebrating the diverse talents of our members, many entries will be judged live on stage. You can view and download a copy of the Showcase Handbook at www.californiagrange.org/showcase or for more information call (916) 454-5805. Annual Talent Show. Saturday, October 13, evening. Performing artists representing Granges from all over the state will compete in our annual Talent Show. The winning act is eligible to represent California at the National Convention in Idaho. 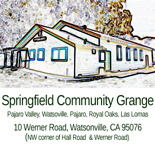 This entry was posted on July 16, 2012 by springfieldcommunitygrange in Events and tagged 2012, California, Convention, Grange.